Today we’d like to introduce you to Heather Monahan. Heather grew up in Worcester, Massachusetts and graduated from Clark University. She began her career in sales and quickly advanced to top salesperson and Brand Manager within her first year in corporate America. A year later, she began her career in the broadcasting industry and joined Wilks Broadcasting as a salesperson in radio. Within a year, she was offered an equity partnership which required her to move to Saginaw, Michigan. Heather made the move to the Midwest for the chance to create value and potentially sell the Saginaw properties for a gain. Within three years in Saginaw, she significantly increased the group’s value resulting in a successful sale of the properties more than doubling the purchase price from 27M to a final sale of 55M. Heather then moved to Naples, Florida to begin working for Beasley Broadcasting where she started as a Director of Sales. Within a year of creating substantial revenue results, she pitched herself for a position that didn’t previously exist and was awarded the VP of Sales title for the company. A few years later, she pitched herself for and was awarded the newly created Executive Vice President of Sales role and ultimately the Chief Revenue Officer title. While Chief Revenue Officer, Heather oversaw the entire sales organization and led the group through multiple acquisitions and product additions yielding a successful merger doubling the top line revenue. During this time, Heather launched her personal brand to empower others and give them the insight and tips she had longed for as a young professional. She was the Keynote speaker at the Corinium CRO conference 2017 and held the main stage at the LOAC in NYC. Heather was recognized as a Glass Ceiling Award winner and as one of the Most Influential Women in radio in 2017 before her unexpected termination. In late 2017, Heather chose to make her company Boss In Heels her full-time job. 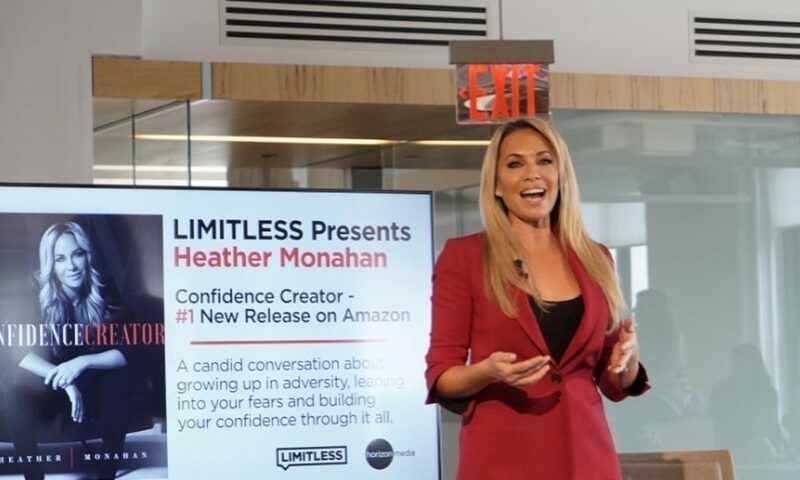 Over the next few months, Heather was featured on the Elvis Duran Radio show, wrote and self-published her first book entitled “Confidence Creator” and was named the Brand Ambassador for Perry Ellis International’s female brand “Rafaella”. Subsequently, she was named a limit breaking female founder by Thrive Global and was picked up by the Harry Walker Speaker agency. She is also a member of the Florida International University (FIU) Advisory Council to further serve as a mentor and leader in the South Florida community. Heather was the keynote speaker at the 2018 Entity Women’s summit, the mistress of ceremonies for the Miracle Makers 60th anniversary Big Brothers Big Sister Luncheon and fashion show and has been tapped as the Keynote speaker for the S.H.E. Summit Bacardi this September. Since her book launch she has also delivered the Keynote for Horizon Media’s Limitless group, iHeart Radio Miami and Las Vegas, Entercom Miami, MGM Las Vegas, Zenith Media’s Blue 449 and various sororities across the country in addition to the Aces night for the WNBA. Heather is scheduled to speak this fall to numerous top-tier organizations including: Royal Caribbean, BNY Mellon, Greenburg Trauig Law Firm, Boise University, FIU, University of Miami Business School, Miami Dade College Honors School and Miami Dade College Innovation group in addition to Worcester Academy where her book has been added to the curriculum. Heather will be the recipient of the “Star Dust” award this November from the Starz Foundation recognizing her work to elevate others after overcoming adversity. “Confidence Creator” was released on Amazon May 22nd and immediately took the #1 New Release in the categories of Business Motivation & Self Improvement, Women’s Personal Spiritual Growth, Self-Esteem, & Personal Transformation. Before the end of the first week “Confidence Creator” claimed Amazon’s #1 Best Seller in Biographies of Business Professionals, Women’s Personal Spiritual Growth and Personal Transformation. Heather has been featured in USA Today, Bloomberg, CNN and various other media outlets for her work to elevate others. There has been nothing smooth about it! It is so funny that people often think things look perfect on the outside however that is never the case. From getting fired, which was one of my lowest moments to realizing that I could take a chance on myself and all of the ups and downs along the way becoming an entrepreneur. To self-doubt creeping back in weeks before my book launch to the haters that showed up trying to put down my work or the people that I had hoped would show up to help me that never showed at all. However, through all of the struggles and learning to work on my own rather than with the help of a large team I have found so many phenomenal people that have shared how my book has helped them and in turn how they want to help me. This experience has been like a roller coaster and has also been the most rewarding professional experience of my life! Boss In Heels was founded to pull the curtain back and share the tips and tricks that everyone should have access to in order to get ahead in business and in life. I am the bestselling author of my book Confidence Creator and have recently begun writing my second book. As a self-published author, I launched my publishing company, Boss In Heels, this year as well. I just finished a video series around Confidence Creation for those that prefer videos to reading, and I recorded and launched my first audiobook this year where I am the narrator. I am a keynote speaker for the Harry Walker Speaker agency working with fortune 500 companies, universities and teams to develop confidence on the court and in the workplace. Confidence Creator was also just added to the curriculum at Worcester Academy in the health and wellness program. I am constantly evolving and innovating around the topic of confidence creation and have just begun a new initiative to create a product that will enhance confidence creation. I am most proud of my transparent approach which is very unique in our current environment full of fake news and fake filters. Approaching my business, as I have always approached business whether in corporate America or as an entrepreneur, as an extension of myself where I lead by example and share my low moments in addition to my highlights to ensure others know that they are not alone. Miami is an amazing location because of the sheer beauty of living on the water and so close to the beach and these fantastic palm trees! Beyond Miami’s exterior beauty, our city is phenomenal for business as a result of the diverse population. Because of the amazing people in this city, my book has gained access and entry points to so many different countries around the world it has blown me away. To get notes from people from the Ukraine, Dubai and countless other locations outside of the U.S. reminds me that living in a culturally diverse city provides opportunities others simply don’t have access to.